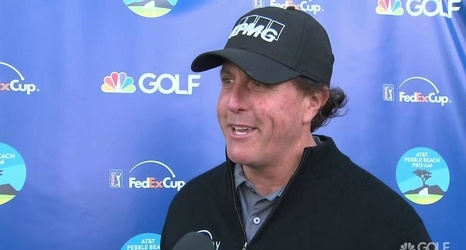 PEBBLE BEACH, Calif. – Phil Mickelson pulled the coin out of his pocket as he walked to the 18th green Monday morning to close out his record-tying fifth AT&T Pebble Beach Pro-Am victory. It’s a silver dollar minted in 1900, a memento passed down from his grandfather, Al Santos, and Mickelson's ball marker this week on the iconic seaside course. He showed it to his brother and caddie, Tim. “He didn’t have to,” Tim said outside of the scoring trailer as his brother went to hoist another trophy, the 44th of Phil’s career.